This new tattoo for David Beckham, who has dozens and dozens of tats inked all across his body, is located just below the “Buster” tattoo he had done just last year, as a tribute to his eldest son Brooklyn. In addition to his “Buster” tat, David has scores of other tattoos inked in honor of his loved ones, and it’s possible this new horse ink may actually be a nod to his wife of 17 years, Victoria. 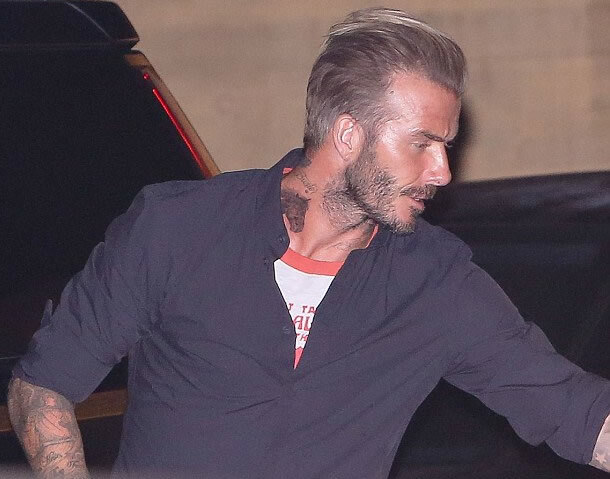 There’s no word yet on the actual meaning behind David’s new neck tattoo, but we all know that Victoria Beckham is obsessed with horses, and the couple has even been spotted riding horses together on family vacations. If David’s horse tattoo is, in fact, a tribute to Victoria, the ink joins several other tattoos the model has gotten over the years to show his love and support for his wife, including a Sanskrit tattoo of her name on his arm, a tiny “99” tattoo on his pinkie finger representing the year they were married, a Hebrew tattoo on his arm reading “I am my beloved’s and my beloved is mine,” and an anniversary tattoo on his wrist of Roman numerals symbolizing a secret commitment ceremony they took part in in 2006, among others. 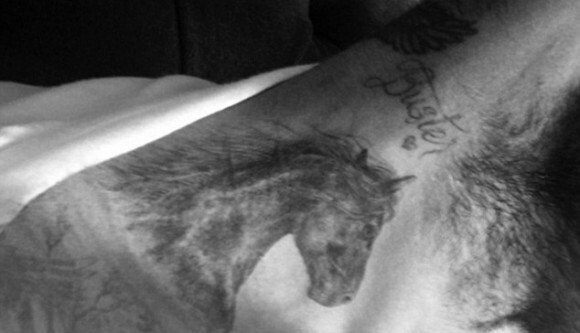 What do you all think of David Beckham’s new horse tattoo? Is it a tribute to Victoria, a symbol of his own love for horses, or something else entirely?? He also got a new tattoo on his right hand’s fingers – My Love….